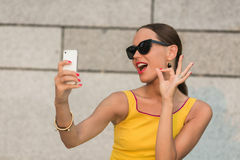 Fashionistas tales - Fashion Designer life : 7 Fashion apps you should have in your phone ! In this blogg post i will present to you some of the best fashion apps out there! This app works quite interestingly,once you sign in with your e-mail any instagram you like that has shopping link will automatically send you to your e mail the products you liked! Its perfect if you have a wish list. Is your best friend for finding designer shoes - colabing with biggest names in industry Stylect can offer you everything you need,from classy Loubiton to sporty Nike - Stylect also works on finding you the best discounts,so you better download this baby now! Polyvore is household name of stylists from all over the world,this handy little app helps you find and style on the very spot all kinds of fashionable garments - all while being great platform for you to showcase your personality and fashion sense to the whole world and let them judge you - there are even contests in styling where you can ear some great fashion prizes! This app brings some fashion organization to the table among other things - you can upload pictures from your own clothes and mix and match them together in this very app to see how they fit together without having to do the same thing in real life a minute before you have to leave the house,you actually have a calendar in this app that can hellp you keep track of combos you wore or you are planning on wearing! I mean how awesome is that,right? Etsy is place where artists come to sell their beautiful stuff - from random art for house to beatiful fashion garments you all should have. Glit is an app that will show you the best sales online,the ones ranging up to 70% - if you are passionate shopper you should probably own this app.